And it's not because The Sewing Lawyer's sewing room has been transformed into Santa's workshop this year. Oh no. Last year I was busy as the proverbial bee, secretly refashioning all those bits into fun presents for the entire family. This year, I've got too many ideas on the go, and sorry, they're all for me. I'm trying to convince myself that doing a bit at a time on them is an overall advance, but it may be well into 2012 before any of these see the light of day. You've already seen prototype no. 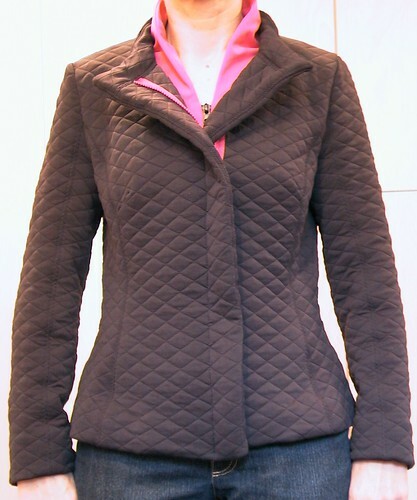 1 for this - my quilted curling jacket. They say that a "wearable muslin" should be made up in fabric similar in hand and weight to your intended "good" version. Well, on that theory, this jacket was a big fail as a muslin. The knitted version is stretchy and puffy while the intended "fabric" - luscious lamb leather - is sleek and firm. Apart from the too-low armscyes, I couldn't tell if the pattern would turn out well in leather. And I wasn't certain if the armscyes would really be too low, if made in a fabric that wasn't prone to stretching in the length. But the curling jacket did pass the "I think I like the style well enough" test. So I made a real muslin out of some hideous green woven stuff I found a bolt of at a thrift store. I'm still liking it. And it turns out that raising the armscyes by about 2cm was a good call. But this muslin shows the things that still need adjusting. I over-adjusted at the hip when I graded out to a size 40. I'm going to remove the extra width at least at the side seams. The neck seam is about 1cm too high. I have a forward neck. This won't matter a bit when the jacket is open, as I'd probably wear it about 98% of the time. But I'm going to lower the neck, and lengthen the collar accordingly. The bust darts are too long. This could be a marking/sewing error. I'll sew them shorter in my good version. The sleeves are a tiny bit too short, though I already took out my customary 2.5cm. 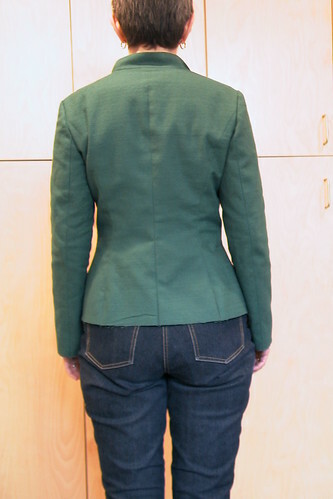 As you can see better in this view of the back, the shoulders are a tiny bit too wide. 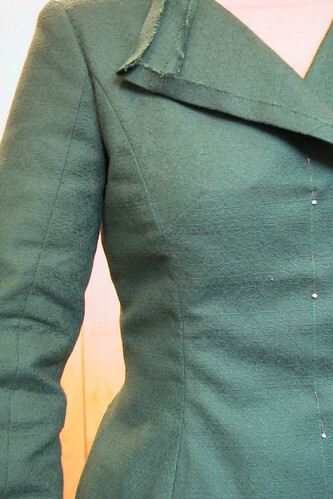 I am going to think about whether to adjust the pattern, or (easier) fix this with some shoulder structure in the jacket, with minimal padding. I really like how the seam on the front of the sleeve lines up with the princess seam. 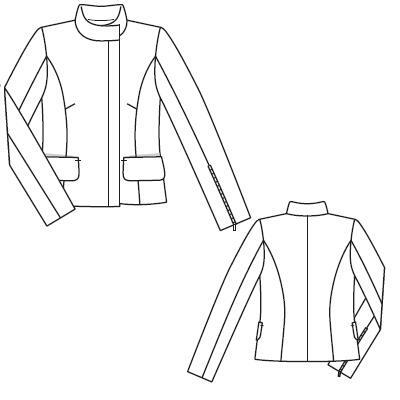 I'm going to plan the zipper placement properly and put a seam in the right side facing and the left jacket front, rather than apply the zipper on top of these pieces. I have deluxe Riri zippers for this jacket, and even though the front one will be partly hidden, the shorter ones in the front sleeve seams will be on full display. 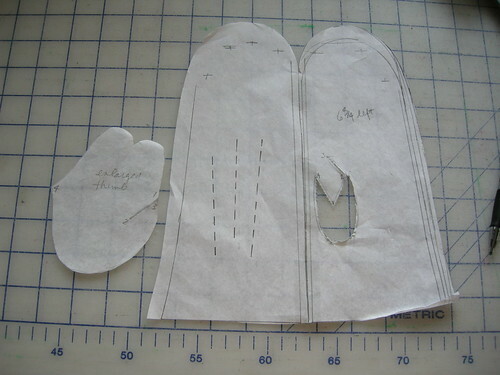 I am going to retrace this with my adjustments, and 1cm seam allowances. I will make a pattern piece for every single piece, i.e. 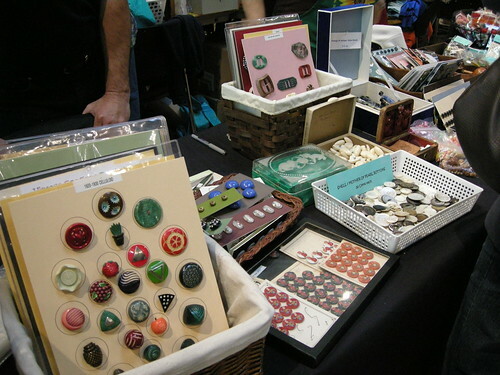 one for each of the left and right sides, as taught by Kathryn Brenne. 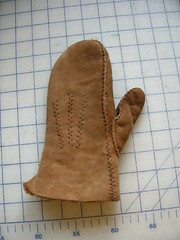 I've made leather mittens before. But the ones I've got planned will up the ante, in terms of the complexity of the pattern. 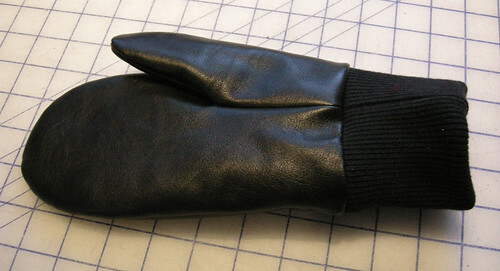 I recommend Make your own gloves by Gwen Emlyn-Jones. I've had a copy for years but confess to not really having examined it before being challenged to replicate these worn-out mittens. There are patterns in the back, in several sizes. I mocked up a pattern, which I enlarged since my material is a little thick. 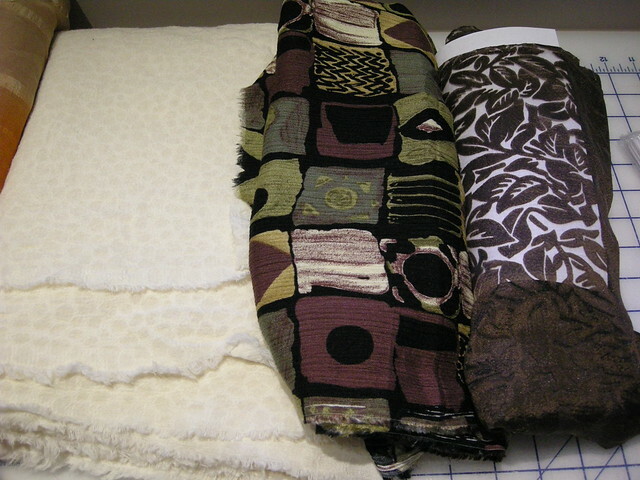 I then made a muslin out of fleece scraps. Frankly I had my doubts about the thumb, which looked so much bigger than the hole it was to go into. But it was absolutely the perfect size, and the muslin turned out pretty well, as you can see here. These are sewn together by hand - a simple running stitch - but they go together surprisingly quickly. I have some quality time with a glover's needle ahead of me. I'm well into my version of this great sweater/jacket. The pattern is available free here (in English) and here (in original Finnish). I'm making it in a gorgeous teal colour. Pictures to come. Or check out my progress on Ravelry. 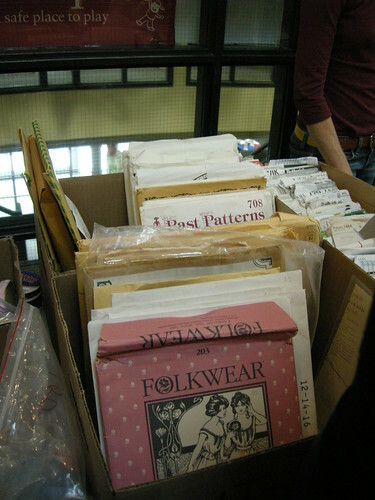 The Sewing Knitting Lawyer has a new problem - in fact it may be an addiction. This is such a surprise. As I have mentioned here before, I used to knit. But that was (most recently) in the 80s! A few years back I thought I'd make a little sleeveless shell and bought some yarn and started ... and stopped. Not interesting, too slow. I figured my knitting career was over. But now, Wow! I can't seem to put the darned needles down. What is happening? Anyway, I am signed up on Ravelry (as Kayyy) and this is my most recent FO. The pattern is one of the thousands of free ones, and it is a fast project. 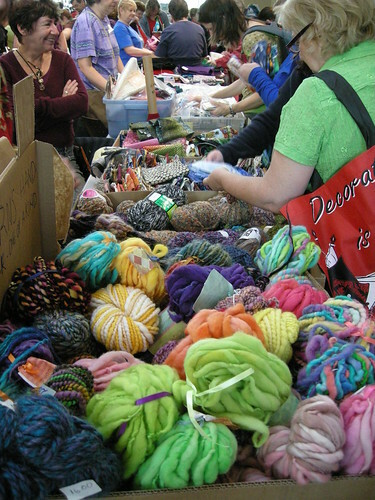 I bought the yarn (Diamond Yarn Merino Superwash Aran) last Sunday afternoon. By bedtime that night the hat was 6" tall. I finished it on Thursday and wore it Friday. I love the way the pattern spirals up to the pointy top of the slouchy hat, and turns into a perfectly tubular I-Cord. For someone who had never knit I-Cord before, doing so was ridiculously satisfying. There is supposed to be a bead on the end of the I-Cord but for now, I've just tied it in a little knot. My very cherry slouchy hat keeps my ears warm. And it doesn't look too terrible on either. The colour is more accurate in the other pictures. This afternoon I bought some Cascade 220 (100% Peruvian highland wool) to make this sweater. It's a delicious turquoisey-blue colour. It promises to feed my new addiction for more than a week. This thrifted sweater is made of lovely stuff - 70% mohair, 30% nylon. It's a beautiful colour. But it's gigantic on me, albeit labelled as a medium. The collar, cuffs and lower edge each end in a length of (right-side out) stockinette stitch, which forms a curl, and then a short length of ribbing to cinch the garment in. Yick. I considered trying to unravel the sweater but in order to ensure that this turns into something wearable in my lifetime, I have pretty much decided to take it apart and treat it as fabric. I'd love to turn the sweater into this top from the November, 2011 Burda Magazine. There is not enough of it, big though it is, to cut the two fronts Burda asks for. Though, maybe, I could cut a partial inner front? Hmmmmm. Remember the pink zipper? There is a tiny bit of method at work. The Sewing Lawyer has a new pink top to match. Actually, it makes the zipper look a little ... dull. 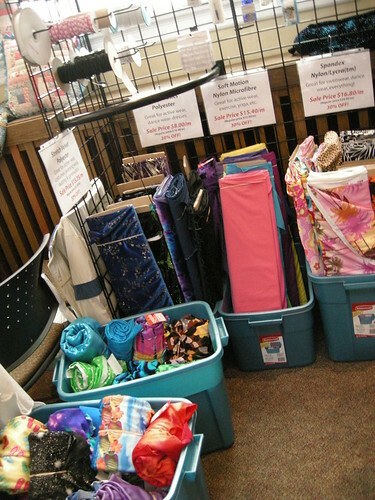 For anyone who was at PR Weekend Montreal, the pink fabric was purchased at Suzie Stretch. It has a nice smooth jersey face and a loopy wrong side. I'm hoping that makes it a little bit warmer than simple jersey. But will somebody please remember to remind me to check the direction of most stretch BEFORE cutting? This top (Jalie 2682) has a double layer upper front and it's straining a bit. I think it would have been more comfortable cut on the crosswise grain. Since I have two more vivid colours of this same fabric (turquoise and bright yellow!) there is a chance that I'll get to test this theory out. I like this pattern a lot. 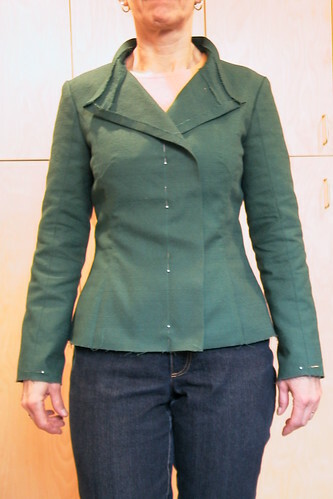 The jacket got retrofitted with a little underarm gusset to help with the mobility problem. It went curling on Wednesday. I'm pleased to report that the gusset works and the jacket was cozy warm. 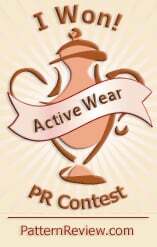 I'll try it with the pink top this week. Maybe the vivid colour will psyche out the opposition! In the meantime, The Sewing Lawyer finished this lacy scarf and is itching to try a new knitting project. What do you think of this sweater/jacket? I love its texture and structure. This is vaguely-a-test of the pattern provisionally earmarked for The Sewing Lawyer's next leather jacket project. It's #107 from the famous September, 2010 edition. It's in progress only (as you can see from the pins). But this fabric bears NO resemblance to leather. It's a quilted knit, quite stretchy (and annoying to sew). It can't be pressed. It won't lie flat. The seams are all topstitched with one of the amusing utility stitches built into my Pfaff sewing machine. I'm only persevering with it because I have the feeling I will actually wear this curling and schlepping around the house. It's kind of cosy. 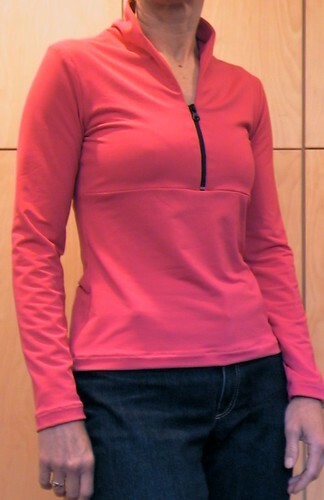 Both the fabric and high-contrast zip were chosen for stash-reduction purposes. Do I get extra points for using bulky space-consuming stuff? I only noticed that the right front is about .25" longer than the left when I looked at this photo. I am not going to fix it since this would require unpicking the topstitching and I fear making more little holes. I am pretty sure the fashion police won't bother with me about it. I am going to make a Q&D muslin in a woven fabric to be sure before cutting the leather that this is too big and sloppy in the body, and too low in the armscye, and to find out what the collar will really look like. For the armscye problem, I am going to (carefully) unpick the lower armscye and insert a gusset. 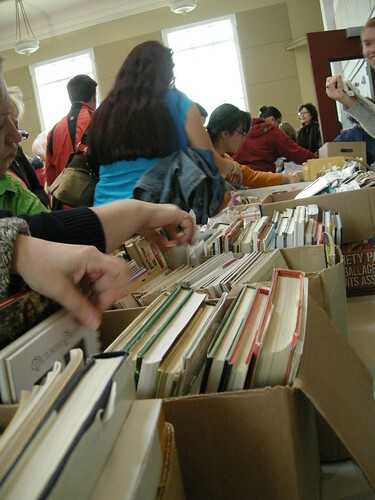 * Centre front. Nice one, Kay! I'm under the perhaps-delusional impression that my fix will not be noticeable. 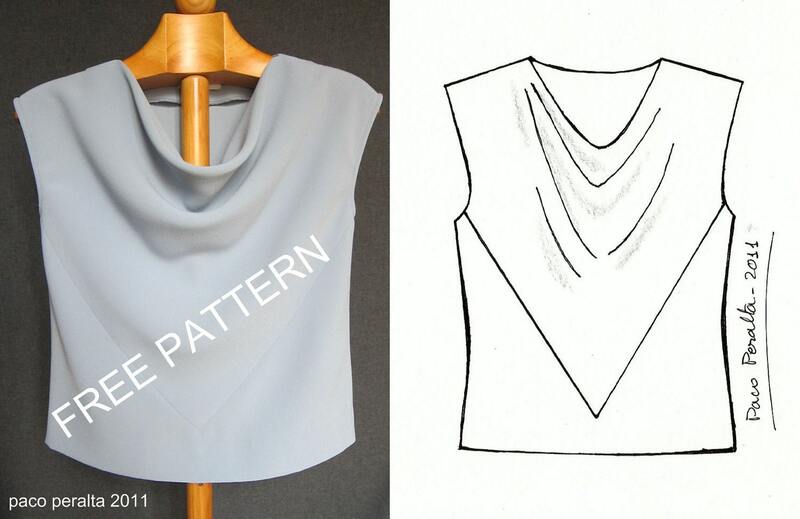 I was pretty excited to see that Paco Peralta was offering a free pattern for a draped top to anyone who ordered from him in November. I placed an order at his Etsy store on November 1 and my package arrived today. I ordered the cape and skirt set. I received the draped top, as promised. 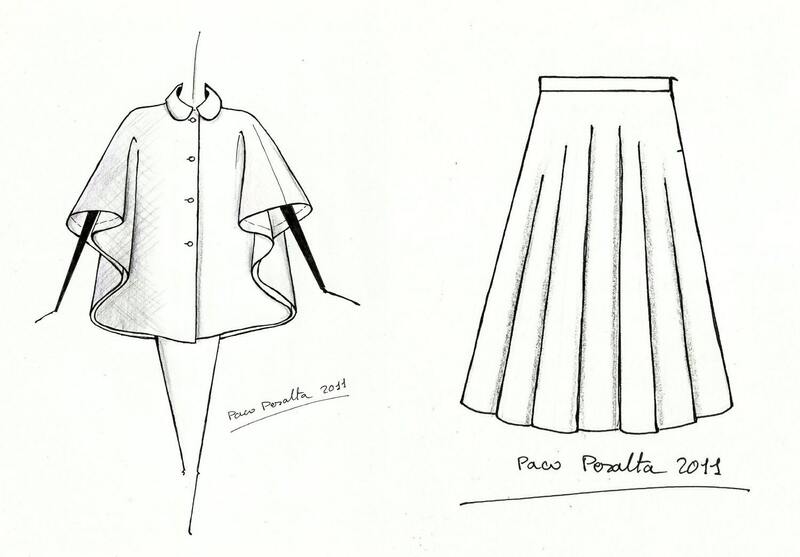 He wrote "It is my pleasure - I'm sure you will make a beautiful version of this skirt." Paco, I hope I can live up to your expectations! I'm on the fence about whether I want or need a yellow wool lace scarf. However the yarn was in stash (and is a lovely colour) and the pattern is easy enough. And now ... back to my regularly scheduled craft. Sewing. I'm testing a pattern which I traced more than a year ago as a possible alternative to the Material Things Fearless Jacket pattern, when I was having so much trouble with it. But then I persevered and this one got left behind. I've got it cut out in a strange quilted knit which might (or might not) make an interesting jacket on the curling rink. It might also tell me whether I want to commit to this pattern for my brick red lamb leather. What's that, you ask? The curling pants are finally finished. 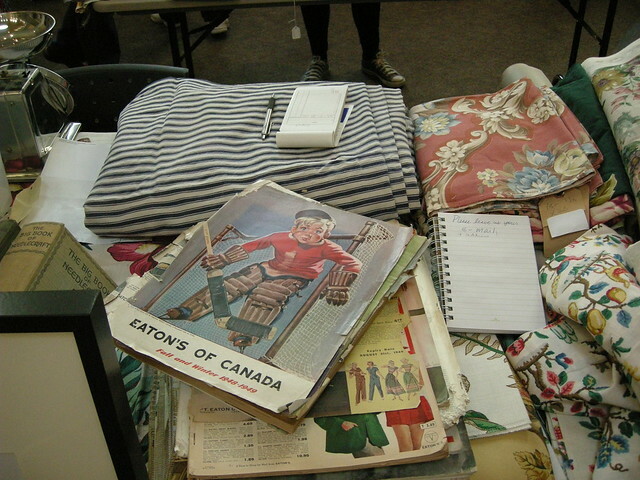 And even though they haven't been tested in the large fridge that is the curling rink, The Sewing Lawyer predicts that they will be quite up to the task of keeping her warm, and not gapping or binding while the curious posture required in curling is attempted. I've been wearing a pair of cast-offs since starting to curl a couple of years ago. They are RTW, ripstop nylon lined with some kind of black synthetic knit fabric with a plush surface. These pants sport a gathered elastic waist and cuffs, and have side zippers. Ick. Last year at Fabricland, the great Canadian chain store, they had a rather nice and very beefy ponte-type knit. I couldn't resist and a pant length came home with me. In stash, a mistake from on-line shopping years ago at Wazoodle, was quite a lot of of black synthetic (supplex nylon) knit fabric with a plush surface. It's softer than the lining of my RTW pants, by a factor of 10 or so. 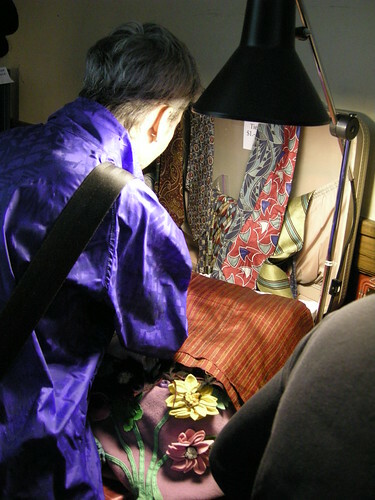 I muslined the interesting pants from the December, 2009 issue of Burda Magazine. Here's the line drawing. 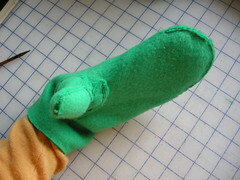 The curved seam goes around to the back where it incorporates the dart shaping needed, and makes a little yoke. I left off the pockets. The biggest challenges in making these were to ensure the seams would stay flat and smooth in both lining and outer fabric. I sewed the pants entirely on my sewing machine, using a 1.5x1.5mm zig zag stitch which is stretchy but thin enough to press open. For the outer layer, I topstitched using the same tiny zig zag stitch before trimming the seam allowances. In the lining, I flattened the seam using a 3-step zig zag, and trimmed the seam allowance very close to the stitching. This worked really well. It's hard to take a good picture of a really black garment, and the camera finds every bit of lint! To keep the waist and fly front relatively bulk-free, I used a cotton woven fabric for the waistband and fly facings, and the fly shield. I also interfaced the outer waistband to reduce stretchiness almost to zero there. 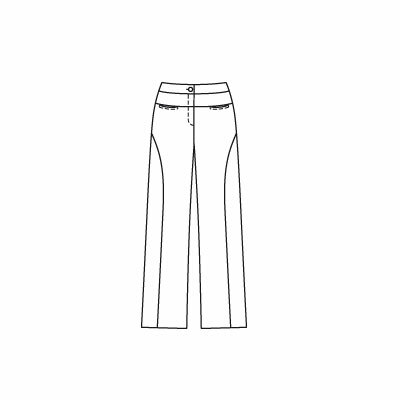 This pattern has a nicely contoured waistband pattern with side seams and CB seam for fitting. 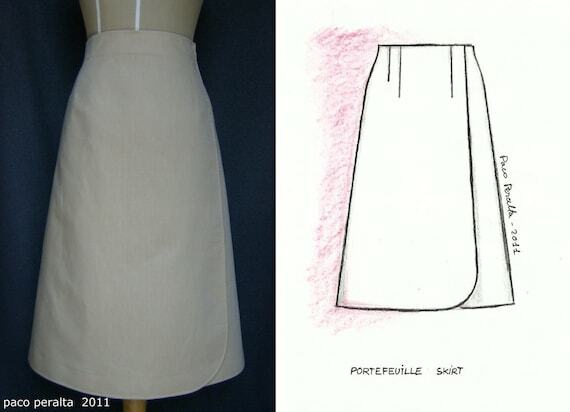 I used my fold before stitching, always-perfect waistband technique, illustrated here, except this was the quick and dirty (i.e. not couture, no hand-sewing) version. After the facing is pressed and folded as illustrated in the earlier post, pin it securely to all edges, and simply topstitch around the entire waistband by machine. I used the little zig-zag again for consistency. 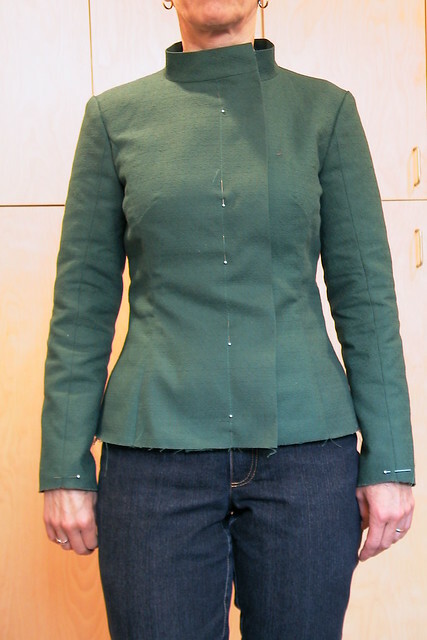 A jeans button (hammered in, no sewing!) and machine sewn hems through all layers completed these pants. And they are SO COMFY! First, please admire the perfection of the pink cashmere, neatly wound into a ball (or is there another name for one of these?) using my new wool winder. Though my husband says I should be sure to mention what a headache it was to make the #*%# thing, I think it's brilliant. 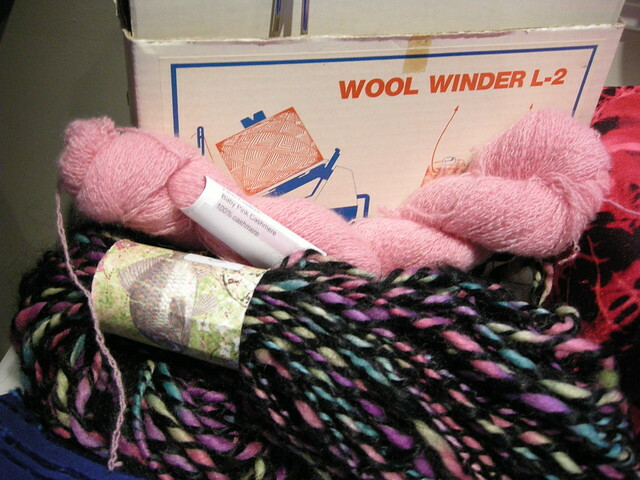 The wool should unwind neatly from the centre. No doubt this is all old news to you knitters out there, but it's new technology chez The Sewing Lawyer. In other breaking news, I successfully changed my second bra (the front closing one) into a standard back-hooking bra with a closed bridge in front. It actually wasn't that hard and it fits so much better. Before, the wires were not only too far apart, the bridge was too low which meant the wires were not at the right angle. Now, as you can see, they come up higher at CF where they are more vertical. 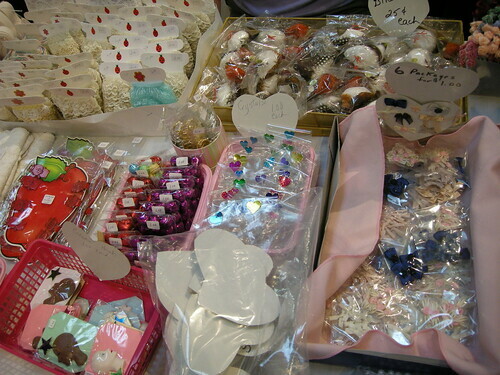 I sewed on 3 of the little pink/écru bows that I bought at the Fabric Flea Market yesterday. I think they look kind of cute! 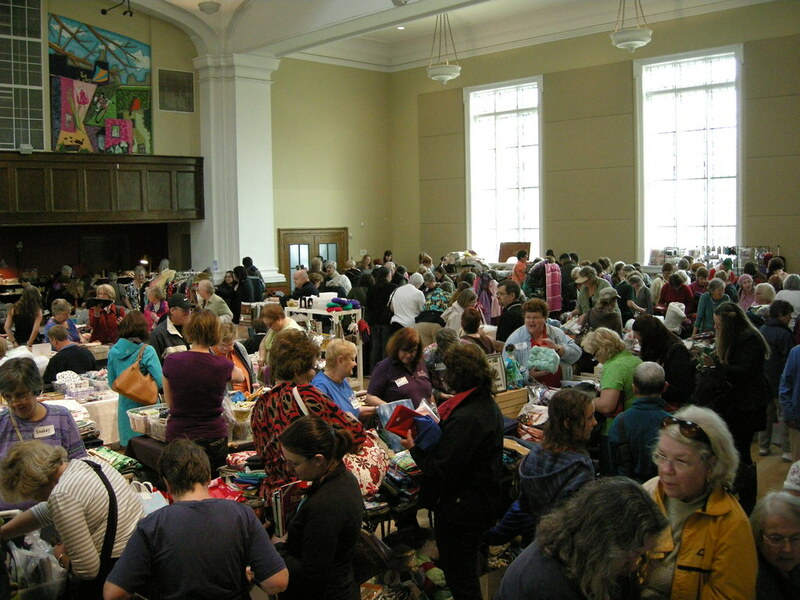 So I have long been involved in organizing the Fabric Flea Market. Annually since 1995. 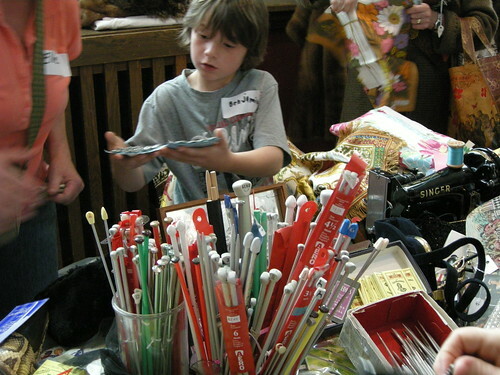 In addition to being a great fund-raiser, it's a stash transfer tool. We give the stash-busting vendors, most of whom have reached SABLE*, a way to recoup some of their investment from stash-building purchasers. Maybe some of the purchasers don't realize that they, too, have reached SABLE. Like me. I'm still in denial. Without further ado: my haul from yesterday. 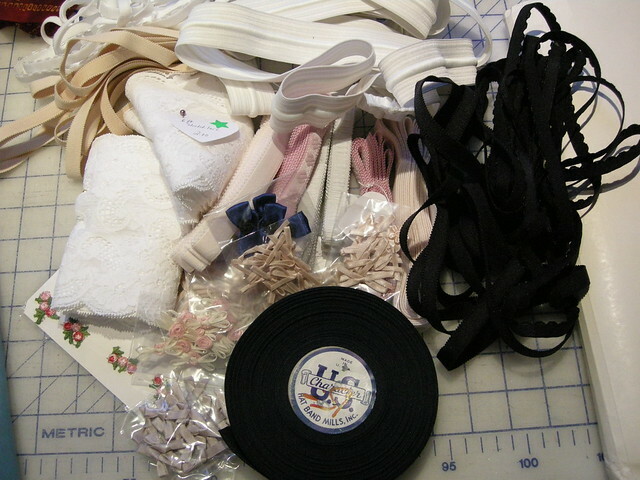 Starting small: stretch lace, elastic of various kinds, including plush picot elastic & strap elastic for more bra-sewing. 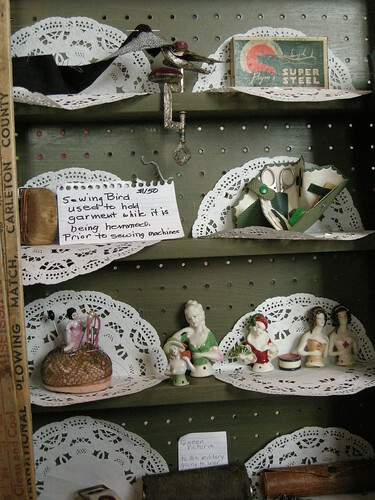 Also, tiny bows and flowers for lingerie-decorating. That's a roll of dark navy grosgrain ribbon at the bottom. 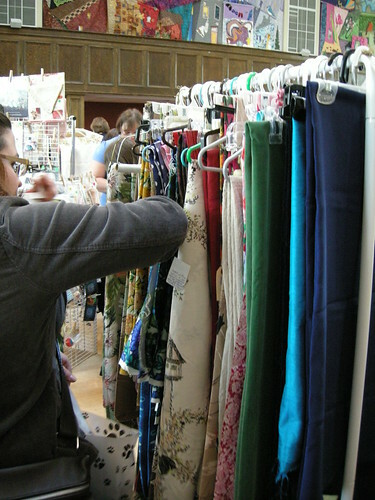 It's rayon and wonderfully moldable with steam and heat, for facing waistbands and other behind-the scenes uses. A really interesting wool (maybe a blend) woven with texture and stretch; crinkle rayon print; silk burnout (with white paper behind to show the pattern). 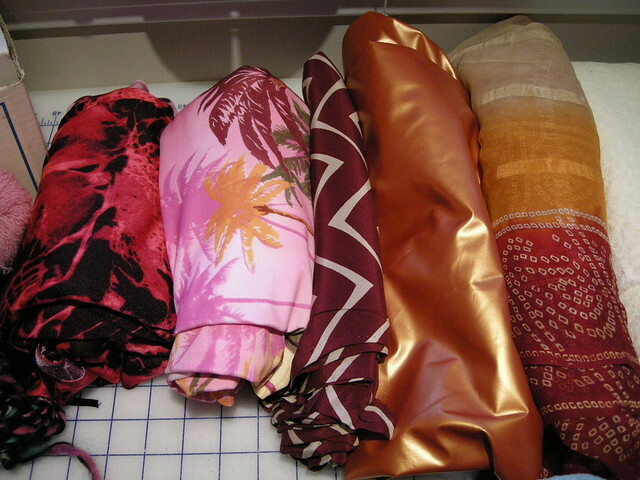 Nylon/lycra for workout clothes; 100% poly swimsuit fabric; silk crepe with zig-zag design; amazing coppery raincoat fabric; silk chiffon sari, with ombre border print. 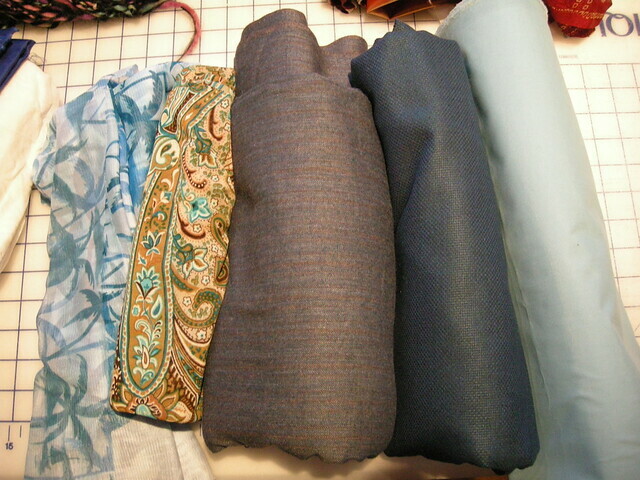 Two stretch mesh prints; teal/brown viyella; wool/silk dress fabric (shirtdress? ); more raincoating (the true colour is more turquoise). Wool winder to turn 100% cashmere repurposed yarn and hand-spun, hand-dyed black mohair with wool/acrylic blend yarn into neat, usable balls. There seem to be some colour themes developing. I knew about the brown and teal, and of course the orange, but the pink is a surprise to me. I'm a complete sloth today after two days of intense fabric-related work. Enjoy!